Indigro Upstream Black Lake Colourant is a concentrated easy to use aquatic colourant. Natural dyes darken the water and preclude sunlight from promoting re-growth of algae and weeds whilst giving a much improved aesthetic appearance. Applied at the surface, it rapidly disperses downwards to provide a natural black colour within minutes. Upstream Black has been designed for effective use with Upstream BioClear. Roundup Weed Killer Pro Active 360 is a foliar applied translocated industrial weed killer developed using a new surfactant system known as Biactivator adjuvant technology. 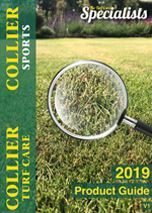 Buy online from Collier Turf Care. Gallup Hi-Aktiv Amenity is a strong weed killer for the control of most broad-leaved and grass weeds, especially common couch or scutch. Buy online safely and securely from Collier Turf Care. Pro Crystal is a bio-product containing bacteria that controls swimming and floating unicellular and filamentous algae found in ponds, lakes and stagnant expanses of water favouring their development. Its use improves the clarity of the water and reduces unpleasant odours only days after it has been applied. Upstream Bio-Clear contains a blend of colourless and odourless bacteria that quickly consume dissolved nutrients in the water effectively starving the algae of its food source. Other strains of bacteria in the formulation also help to consume the buildup of organic material at the bottom of the water such as leaves and other dead plant material.